Prime Minister David Cameron has commissioned a review of the Muslim Brotherhood's UK activity, No 10 says. The Muslim Brotherhood is an Islamist movement which has been declared a terrorist group by Egypt's government. Recent press reports have suggested members have moved to London to escape a crackdown in Cairo, where the group backs ousted president Mohammed Morsi. Number 10 said the review would examine the group's philosophy and activities, and the government's policy towards it. According to the Times, it was prompted by evidence received by the government that Muslim Brotherhood leaders met in London last year to plan their response to events in Egypt. The Prime Minister's official spokesman said that the "main conclusions" of the review, which is due to be completed by the summer, would be made public. Asked what had triggered the review, he said that the government had received a succession of reports from its embassies in the region, building up a picture which the PM believed should be examined. But No 10 has not provided any details on which bodies are to be involved in the review. The Muslim Brotherhood was founded in Egypt but now operates in many states and has influenced other Islamist movements around the world with its model of political activism combined with Islamic charity work. Whitehall officials have suspected for some time that a small number of people belonging to the Muslim Brotherhood here in the UK also have links to violent extremism. But these are believed to be individual cases rather than part of a collective policy. 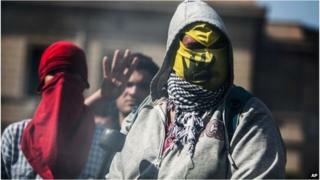 Banning the Muslim Brotherhood as a "terrorist organisation", as Egypt and Saudi Arabia have done, carries a risk. It supports the argument of jihadists that the only way to achieve an Islamic state is through the bullet not the ballot box. But conversely, with political Islam coming under pressure in the Middle East, the UK government will be wary of once again letting London and other British cities become a haven for radical Islamists as it did in the 1990s. While the Brotherhood - or al-Ikhwan al-Muslimun in Arabic - says it supports democratic principles, one of its stated aims is to create a state ruled by Islamic law, or Sharia. Its most famous slogan, used worldwide, is: "Islam is the solution." The organisation's backing installed Mr Morsi as Egypt's first civilian president in 2012, but he was ousted in a military coup last year after widespread street protests. In December, the new Egyptian government declared the Muslim Brotherhood a terrorist group after blaming it for an attack on a police station that killed 16 people. A Downing Street spokesman said in a statement: "The prime minister has commissioned an internal government review into the philosophy and activities of the Muslim Brotherhood and the government's policy towards the organisation." The review is being led by Sir John Jenkins, Britain's ambassador to Saudi Arabia, another country which has declared the Brotherhood a terrorist organisation. The Times quoted officials as saying it was "possible but unlikely" the movement would be added to the list of groups banned by Britain for terrorist connections. Slogan: "Islam is the solution"
Meanwhile, a date of 26-27 May has been set for the first round of Egypt's presidential poll, days after army chief Field Marshal Abdul Fattah al-Sisi resigned and announced his candidature. Correspondents say Mr Sisi, who led the overthrow of Mr Morsi, is likely to win the presidency given his popularity and the lack of any serious rivals. If he does not win more than 50% in the first round of voting, a second round will be held on 16-17 June. Since Mr Morsi's overthrow, more than 1,000 people have been killed and thousands of Muslim Brotherhood supporters detained in a crackdown by the interim authorities which has been condemned by human rights campaigners. Last month, 528 Morsi supporters were sentenced to death and another 919 have been ordered to face trial on charges that include murder.